Netanyahu returns to the U.N. -- now guess the drawing! Netanyahu returns to the U.N. — now guess the drawing! Do you think you have a better prediction of what Netanyahu will share this year? Use the template to make it and send it to us at [email protected] We’ll post the best (or most accurate) entries! Do you think you have a better prediction of what Netanyahu will share this year? A picture of the MIB that cleverly disguises one of those mind erasers? Ba,ba,Bibi is himself the allergory of a Cartoon! great work, Katie. I wish I were artistical. love it! so excited to see what ideas people have. i will have to put on my thinking cap, not my forte. maybe a classic yellow cake box with the words tweaked a little? Netanyahu went with the yellowcake pun after all. Kudos, Annie. he did? i only got the last 10 minutes of his speech. what did he say? something about how it’s not a tasty treat (‘moist deluxe’)? do tell. and to think i felt like a dork w/that long url sitting here for days. i almost erased it. 7:40 P.M. Netanyahu: The Jewish people will never be uprooted again. 7:37 P.M. Netanyahu: My predecessors and I have been willing to make painful concessions, but Palestinians have not yet been willing to do the same, and recognize Israel as a Jewish state. 7:35 P.M. Netanyahu: Many Arab countries have recognized that Israel is not their enemy. Israel welcomes engagement with the wider Arab world and continues to seek a historic compromise with our Palestinian neighbors that ends our conflict once and for all. 7:34 P.M. Netanyahu: Against the threat of a rogue regime that threatens to wipe Israel off the map, Israel is forced to defend itself. If Israel is forced to stand alone, it will, but in standing alone we will know that we are defending many, many others. 7:33 P.M. Netanyahu: If you want to cease Iran’s nuclear program, don’t let up the pressure. The greater the pressure, the greater the change. … Distrust, dismantle and verify. 7:28 P.M. Netanyahu: A nuclear Iran would trigger an arms race in the Middle East and would turn the prospect of nuclear-armed terrorism into a reality. 7:27 P.M. Netanyahu: As dangerous as a nuclear-armed North Korea is, it doesn’t compare to a nuclear-armed Iran. 7:26 P.M. Netanyahu compares Iranian nuclear program to that of North Korea. 7:25 P.M. Netanyahu: Rohani thinks he can have his yellowcake and eat it too. 7:24 P.M. Netanyahu: Rohani thinks he can get away with his “smile offensive” because he’s gotten away with it before; his strategy of talking loud and doing little has worked for him in the past. 7:22 P.M. Netanyahu: Iran has one big problem: sanctions. The sanctions are bearing fruit, thanks to the efforts of many countries. 7:19 P.M. Netanyahu: It’s not hard to find evidence that Iran has a nuclear weapons program, it’s hard to find evidence that it doesn’t have one. 7:17 P.M. Netanyahu: I wish I could believe Rohani but I don’t, because facts are stubborn things and the facts are that Iran’s savage record flatly contradicts Rohani’s soothing rhetoric. 7:16 P.M. Netanyahu: Rohani promises constructive engagement with other countries, yet two years ago Iranian agents tried to assassinate Saudi Arabia’s ambassador in Washington D.C. and just two weeks ago an Iranian agent was arrested in Israel for trying to plot an attack against the U.S. Embassy in Tel Aviv. He’s referring to the leaders of those countries that don’t object to Israel’s mistreatment of Palestinians. These are construed as being “not Israel’s enemies”. Lies. israelis are spreading like a cancer in the West Bank and have been for years. WTF do you call giving you 3/4 of THEIR land?? Wrong. The zio state already started that race. If the zios are so worried about nukes in the ME, let the world “[d]istrust, dismantle and verify” the israeli program. LMAO. Yes, but only because isreal has no present desire to murder random North Koreans with impunity. Interesting. The last time Americans were sent to die in wars on israel’s behalf, the cheerleaders used this same “yellowcake” lie to drum up support. Fool me once, shame on me. Fool me twice, shame on you. or maybe a yellow cake plant. in a pot of course, w/leaves. ok, clearly i need to shut up now. lol, can’t stop laughing. Mr. Netanyahu has a very serious concern. The threat of a nuclear Iran should not be taken lightly. Do we have a hasbarist mole in our midst? mole? moles are undercover. there’s nothing undercover about ludwig. he brazingly ‘explains’ israel. If you were an Iranian official or citizen and you are looking next door witnessing what happened in Iraq which we knew because of IAEA weapons inspector Scott Ritter, head of the IAEA El Baradei and others who were saying there are no WMD’s and the niger documents are very bad forgeries who would not want a nuclear break out capacity? Who? With Israel and the U.S. persistently threatening Iran for years now who would not want a nuclear break out capacity? Rouhani just brought up Israel signing the NPT which Israel has refused to sign over and over again. The international community should be demanding this from Israel. Their massive stockpiles of nuclear, biological and chemical weapons have been a threat to peace in the middle east for a very long time. It is an essential desire deep within humans psyches to operate on a level playing field. Essential. Iran lobbied for a nuclear free zone years ago. Israel is silent on this and persistently threatens Iran. With Israel and the U.S. persistently threatening Iran for years now who would not want a nuclear break out capacity? . . . Iran lobbied for a nuclear free zone years ago. Israel is silent on this and persistently threatens Iran. Our own Supreme Court noted early on that the Congress and the President had adopted laws and taken actions against France that amounted to an imperfect or undeclared war. That’s what the sanctions against Iran’s legal enrichment amount to. The threat of any military strike against nuclear facilities is illegal under the terms of the UN Charter and the IAEA resolutions adopted after Israel’s strike on the Osirak nuclear reactor. Mr. Netanyahu has a very serious concern. The threat of a nuclear Iran should not be taken lightly. Why should we give him a break, when he doesn’t even deserve one according to his own Jewish customs and values? >> Mr. Netanyahu has a very serious concern. The threat of a nuclear Iran should not be taken lightly. Iran has a much more serious concern. The threat of a nuclear AND belligerent Israel that aspires to regional hegemony should not be taken lightly. The Palestinians have a much more serious concern. The oppressive, colonialist, expansionist and supremacist “Jewish State” of Israel’s 60+ years, ON-GOING and offensive (i.e., not defensive) campaign of aggression, oppression, theft, colonization, destruction, torture and murder should not be taken lightly. It’s not serious because if is based on hysteria. The only threat that a nuclear Iran poses is that it ties Israel’s hands in terns of who it can get away with bombing, every time Bibbi gets his blood list itch. This is hilarious, Ludwig. You’re absolutely right considering that the only one who is threatening everyone with a nuclear Iran is Bibi! It’s time to stop taking this blatant lying, posturing, and threatening lightly. Taking it seriously would certainly include insisting the Israeli administration sign and ratify the NPT, or face severest possible consequences, the first of which would be declaring every penny of aid and any military, paramilitary, or intelligence assistance from *any* U.S. source illegal. Foreign Assistance to Israel already does violate the provisions of sections 101 and 102 of the Arms Export Control Act and the Leahy Act provisions of the Defense Appropriation statute. What is particularly frightening is that whereas most terrorists lack the means or ability to carry out their threats, Israel has more than enough nukes and other weapons to make good on this one. In a nutshell, if they don’t get their way they will take the world down with them. If ever there was a good reason to be on a terror watch list and subject to severe sanctions this would surely be it. Unfortunately we now live in what Justin Raimondo terms Bizarro World, a world in which everything is the opposite of what one would normally expect, and Iran, with no nuclear weapons and no history of attacking other nations for many generations is now the greatest threat to world peace. You just can’t make this stuff up. Such nonsense…hollow threats. Isr ‘might’ be able to destroy ‘part’ of the ME but not the world. The minute Isr opened the first nuke silo door the US and Russia would both see it—–would the US or Russia let Isr get off more than ‘one’ of their 80 nukes? It’s probably not so much the silos, as the 5 German-made, nuke armed Dolphin class GoI subs, with one more on the way. There has long been chatter from disgruntled US military brass about GoI’s nukes being more of a threat to the US than Russia’s. I think Hersch talks about this. He certainly talks about why USG is concerned about the Samson Option. Phantastic. Put that sentence into speech balloon of Pinocchio and it will be the winner of this year’s UN cartoon contest. Why not? What’s a “nuclear Iran” going to do? As both the Israeli government and right wing thing tanks like the AEI have predicted – nothing. Barak, Livni and others have acknowledged that Iran would never nuke Israel. Barak has admitted that the only reason Iran would want a nuke, would be to serve as a deterrent. Livni said Israel could certainly live with a nuclear armed Iran. Danielle Pletka, of the AEI, said the greatest threat would be for Iran to build a nuke and not use it, because this would make Iran look like rational actors. The reason Bibbi is scared of an Iran nuke, is because it would incite many Jews to leave Israel. I maintain instead that Bibi is terrified of the absence of an Iranian nuclear weapon, because without it (or fear of it), then a substantial plank of the platform by which he wins elections – and mutually reinforces his neocon pals in the U.S. – disappears. I think it’s very much about power, both of persons and of a cabal, both in Israel and in the U.S.
Can you please explain how, exactly, it’s a threat to Israel which is already a nuclear power? Serious question. Israel’s belligerence and uninspected biological, chemical, and nuclear weapons are of far more pressing concern then whatever it is Likud whines about these days. I’m wasting my time responding to you, obviously, but it’s something that has to be said, over and over and over again. Which explains why the israelis decided to address the point by making a spoof Link’dIn page. Because it’s very serious and should not be taken lightly. Maybe Bebe should channel Dr. Suess. It seems to be currently all the rage. Maybe Bebe should channel Dr. Suess. I suggest the story ‘The Sneetches’. This continues until the Sneetches are penniless and McBean departs a rich man, amused by their folly. Despite his assertion that “you can’t teach a Sneetch,” the Sneetches learn from this experience that neither plain-belly nor star-belly Sneetches are superior, and they are able to get along and become friends. “The Sneetches” was intended by Seuss as a satire of discrimination between races and cultures, and was specifically inspired by his opposition to antisemitism. The theme of Milikovsky’s speech will be pathological narcissism. How about Netanyahu with his finger on the red button ready to drop a nuke on Iran while lecturing Iran about abiding by the Non Proliferation treaty that Iran signed onto years ago. The mushroom cloud sort of gives away what he’s been smoking. Much better you are right. And the blown out of proportion claim that Netanyahu will make is that not only is Iran a threat to Israel but to the world. So guess we could put all flags or symbols of nations/religions into the mushroom cloud. Remember when Netanyahu was talking about his ring, what it represents to him and should according to him represent to others…..was absurd. Can so see an image of him opening the ring with a red button in it to set off Israel’s nuclear bomb capability. The first Palestinian to represent Israstine (aka Israel al jadeed as opposed to jaded Israel) at the UN will be such a breath of fresh air. Israel should be considered an enemy of United States when it tries to block peace between US and Iran. I am a bit worried because this crazy man could do whatever to get his war realized. Colonel Wilkerson has said something very close. Calling McCain and Graham traitors for wanting to interfere or hinder U.S. negotiations with Iran. He told them to “shut up” in an interview. Wilkerson must lengthen his list and speak the names of those so called liberal Dems like Schumer, Wasserman Schultz, Boxer, and many others who have pushed, sponsored and voted for legislation that demonizes Iran based on inflammatory and unproven claims. Wilkerson’s traitor list needs to be expanded publicly. He seems to be the only upper echelon power broker to be willing to call it like it is. Other power brokers tip toe around the issue but Wilkerson has come right out and laid the truth on the line. Great stuff, Katie, but nothing can be quite so ridiculous as that Acme-style cartoon bomb that he used before. I vote for talknic’s first one – lipstick on a pig – hilarious!!! Life often exceed what art may produce. In this case, Katie is merely embroidering the actual speech and prop of Mr. Netanyahu, and quite possibly the actual coming speech will be even more funny. From the point of view of evolutionary biology, it is worth reminding why dinosaurs had such small brains. In a nutshell, they were so powerful that they did not need to be particularly smart. Moreover, big brain consumes a lot of energy and it is not optimal to have a much larger brain than strictly needed. USA and Israel are now in a similar situation as dinosaurs, “brainy” policies are not necessary and thus are eliminated from the political system. For many months now there has been a growing impression, at least to me, that Bibi is becoming completely irrelevant on the world scene. He threatens the Iranians over and over again without them heeding him in the least and everyone on the planet knows that Israel does not have the military capacity, short of nuclear war, to follow up on the threats. He looks like a clown, sputtering away all by himself. He seems to be in a rut that he can’t get out of. Surely the ridicule he is receiving is well deserved. But I am puzzled by one thing: Isn’t there some rational Zionist supporters with influence to stop his antics? How is it that the Israeli people are willing follow this buffoon? Isn’t there some influential American Jews that can talk some sense to him? It so hard to imagine that a country can so deliberately isolate itself from the rest of the world especially in the face of a looming BDS movement that is only going to get stronger. Can’t complain, of course, he is just making the job of the Palestinian resistance movement that much easier. “rational Zionist supporters…” An oxymoron and the reason why someone like a Netanyahu is the face of the Zionist nation. An yes, he and his supportive circle in the US are becoming (slowly) increasingly irrelevant. First your average Israeli Jew has had Likud Zionism pounded into his or her brain from the time they were small kids growing up in their segregated schools in their segregated towns in their segregated country. That there are still Jewish folk there with a semblance of decency is a miracle. As for the “influential Jews” (e.g. the Wiesels, Foxmans, the Dersh) they comprise that cadre of support for Israel that is Jewish Supremacist and consequently will forgive them anything. They are a lost cause; don’t count on them. These idiots have the access to the corridors of power and they are loath to give way to anyone else. Zionism cannot defend itself in the marketplace of ideas. Therefore it must squelch dissent. It is a carry over of a bygone age where it was considered perfect proper for white folk from Europe to plop themselves down in whatever part of the world took their fancy. Absolutely. Thuggery, propaganda and brainwashing from age 4. Ordinary Israelis must be shielded from the truth at all costs.It really is a wonder that people escape from the processing. The man at 6:30 is a Palestinian citizen of Israel. A thinker in a society that doesn’t encourage it. 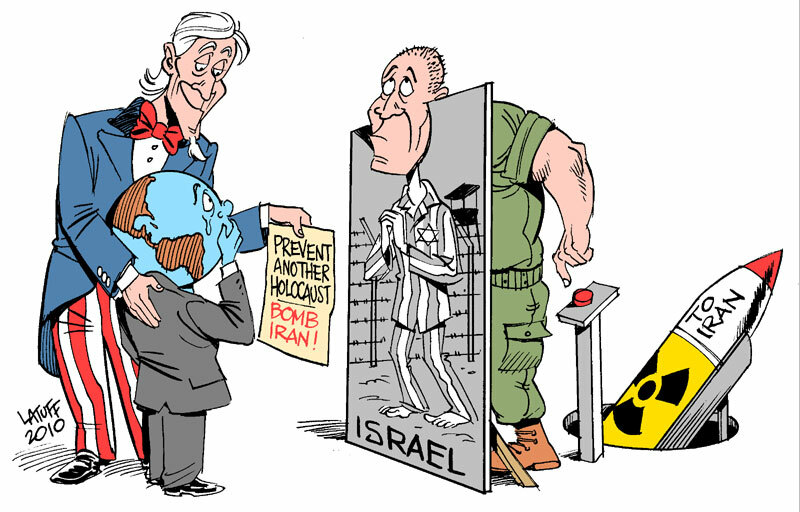 Maybe someone can secretely change Bibi’s cartoon so when he displays it in front of the UN it will be this one? Netanyahu is becoming increasingly isolated, and something of a joke. At the G20 summit in Cannes a couple of years ago Sarkozy was overheard telling Obama he couldn’t bear Netanyahu, and calling him a “liar”. “You are fed up with him, but I have to deal with him even more often than you,” was Obama’s response, and there’s no reason to imagine he may have warmed to the guy since. He may well nail himself in a coffin this coming week at the UN. Hey ho. The American public’s distaste for Israel’s wars is something Netanyahu never understood. Now with Iran coming in from the cold Israel is on its own. It has nothing to offer the world other than lies and torture. The forgotten confidential file contained details on the President’s G20 program. FLASH NEWS – An FBI agent accidentally left his top secret file on Barack Obama at the counter at a Lebanese restaurant in Cannes, France during the G20 summit last November. Ultimately, November’s G20 summit was full of gaffes. Let’s start with the private conversation between American president Obama and French president Nicolas Sarkozy that was accidentally broadcast to a host of listening journalists. But French journalists at the daily Nice Matin recently revealed that an even more dramatic mistake happened the day before when an American FBI agent left a confidential file on the president’s visit at the counter of a local Lebanese restaurant. The file contained a detailed plan of the 5th floor of the Carlton Hotel, where the American president was supposed to stay during the G20. It also included details on each of his routes, starting with his arrival at the Nice Airport all the way up to his departure. Unsure what to do next, the restaurant manager finally found the telephone number for the FBI on the internet. He called and finally managed to convince the agent on the other side of the Atlantic that he was telling the truth by reading the first page of the binder. The young man didn’t even need to give the FBI his address. They had already traced his cell phone and two agents arrived in his restaurant minutes later. Upon reading the file, one couldn’t keep from saying “Oh, my God,” according to Herche. The agents grilled Herche, trying to figure out who could have left behind such a document. They also wanted to know if he had made photocopies. The happy end to the story? The two agents returned every day during the G20 to eat lunch in Herche’s restaurant. Herche, for his part, received the FBI medal of honor. Seems that between the Secret Service and the FBI that Mr. Obama is surrounded by the Keystone Cops too often. I sure hope Obama keeps talking to him, and working with him; it’s a win-win for everybody. “I sure hope Obama keeps talking to him, and working with him; it’s a win-win for everybody.”Citizen. It i s being reported here in Europe, (Sat am) that Obama /Rouhani had a 15 minute telecon late fri. Soon we will see nuttyahoo banging on the WH door demanding he be allowed to play a fly on the wall during such talks or the Palestinians will pay a price. Not much sleep being had in TA lately. Netanyahu threatens to wipe Iran off the Map. Indeed. Because that is what Israel has essentially been threatening to do over and over for a decade. Israel has endlessly been making threats and then squeezing the U.S. to do the same. Yes, ye olde light unto the nations. Time is running out for these vagabonds and their slimey apologists.The sooner we see and end to the zionist project, the sooner we can get back to a somewhat more peaceful planet. Never have so few caused so much menace to so many. ” That summer Tinari Modai, in a letter to the Israeli foreign ministry, had proposed a strategy to “humiliate and shame” pro-Palestinian Israeli activists in Ireland, claiming their activism was rooted in psychological problems. In the letter, leaked to Israel’s Channel 10, Tinari Modai, who also serves as the embassy’s cultural attache, suggested publishing photographs of the activists to “cause embarrassment for their friends in Israel and their family” and sow suspicion among non-Israeli activists that “they may actually be working on behalf of Mossad”, a reference to the Israeli intelligence services. Zionist can dish it out but cant take it. The good news is each and everyone of them is busy wiping the zionist entity off the Map. I said long ago this is not about Isr being afraid of Iran nuking them–it’s about Isr’s ME power position. Iran having nukes threatens Isr not because Iran would use them on Isr but because it takes away the power of Isr’s own nuke threat to Iran and others in the ME. It’s all about Isr as the region’s junior hegemon. The way to end this is for Russia to declare that if any US ‘clients’ use nukes on anyone in the ME they will use theirs in behalf of the state that has been attacked. That would be an excellent standoff. How Will Netanyahu, AIPAC & Rest Of War Lobby React To Iran Breakthrough? I just spoke on the phone to a friend from my AIPAC days. I had called to ask how Netanyahu and AIPAC will respond to the Iran breakthrough. She asked me for my prediction. I said I thought they had no choice but to claim victory. I said that they can just say that the sanctions invented by AIPAC inflicted so much pain on Iran that it surrendered. She went on to say that she thought that AIPAC/Netanyahu was going to do everything possible to sink any possibility of an agreement. You’re mistaken in so far that you believe that Netanyahu can still cut a credible figure at the UN. He is already yesterday’s man and now looks like a McCarthy cutout ranting and raving about some imaginary threat. The difference, of course, is that we are still left with a maverick nuclear state on the Eastern Mediterranean whose own nuclear capacity has to be neutralised. That can only be achieved by economic sanctions in the form of withdrawal of trading rights until such time as Netanyahu or his successor agrees to a Nuclear Weapons Free Middle East. That must and will happen – sooner or later. The international community cannot be held to ransom for much longer by the stratagem of ‘nuclear ambiguity’ that has so contaminated the political scene for the past fifty years since JFK’s untimely passing. The paradigm shift has been a long time coming but the contempt that Netanyahu now elicits is proof of a sea change in international opinion. I have some difficulties believing that “Israel” may consists of such monumental idiots that they would actually believe that they can replace the government of Iran with “one that the United States and Israel can control”. It is beyond capabilities of USA, and thus beyond anything that lobbying in Washington may achieve. Some cretins think that if you bribe and cajole enough Congresscritters you may rule the world. Not. Taking nukes away from Israel is not really possible, but also not that relevant. Of course it is! It is also absolutely believable that the Israelis are delusional– see us after sept 11th and the rampant Islamophobia that still grips the US and Western citizens and their wannabe govts. “monumental idiots” and their leaders, do indeed, exist. Or Netanyahu, soiled diapers in hand, wringing same (and allies) hands over his face and nose screaming: Geppeto, HHHHHHHelp me NOW! I think he’s going to go instead with the Tom & Jerry toons.